BLACK BAY BRONZE BLACK BAY BRONZE BRONZE BRONZE CASE DIAMETER 43 MM WATERPROOF TO 200 M (660 FT) IN-HOUSE MOVEMENT TUDOR in-house movement MT5601. Off ering a 70-hour power reserve and regulated by a variable inertia oscillator with silicon balance spring, it is certifi ed by the Swiss Offi cial Chronometer Testing Institute (COSC). Aluminum bronze alloy case. 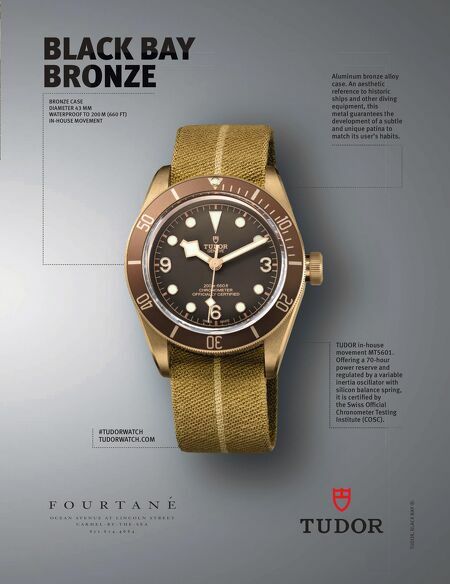 An aesthetic reference to historic ships and other diving equipment, this metal guarantees the development of a subtle and unique patina to match its user's habits. 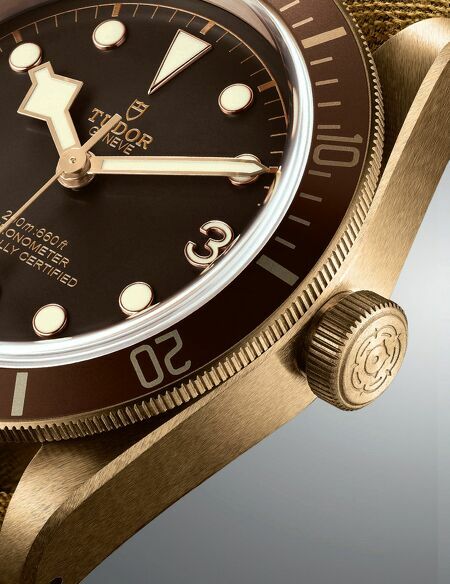 #TUDORWATCH TUDORWATCH.COM TUDOR, BLACK BAY ®.